I've already bought 2 x 27" monitors that have 1 x DVI-D (dual link), 1 x HDMI (v1.3+) and 1 x DisplayPort (v1.2) Ports. Please note HDMI interface less than version 1.3 supports maximum of 1920x1050, while the new v1.3+ will support 2560x1600 resolution. 2. Half Height. I have a SFF (Small Form Factor) enclosure, which has only half height PCI slots. 3. Support up to 2 monitors (either DVI-D dual-link, DVI-I dual-link, HDMI 1.3+ or DisplayPort). DVI single link and VGA will only do 1920x1200. 4. The desktop has a 250W power supply, which is very low power PSU. I've spent more than an hour looking for a low-end graphics card that meets my requirements. I'm not a gamer so I don't need a high-end graphics card, and high-end graphics card generally require maximum wattage beyond my PC can support it. After reviewing a dozen graphics cards, I wasn't able to find one that require only 250W power supply. Reading from other users, a graphics card that require 300W PSU will most likely work with 250W power supply so I took a chance and purchased MSI GeForce GT 710. [Updated 3/31/2017] I received the graphics card today, and replaced the full-height bracket with 2 x half-height LP brackets and they work perfectly. What is the difference between the DVI-I and DVI-D? DVI-D (Digital) carry a digital video signal while DVI-I (Integrated) can carry either the digital (DVI-D) or analog (DVI-A) signal. The extra 4 pins on DVI-I interface (see below) allow it to carry analog signals. 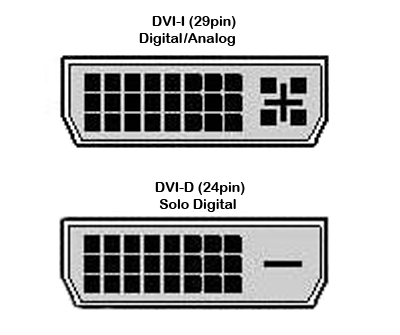 Since DVI-I can carry both digital and analog, it can virtually become DVI-D or DVI-A port. The DVI-D and DVI-I come in single-link or double-link, and single-link supports up to 1920x1080 while double-link supports up to 3840x2400 resolutions. What is the maximum resolution of HDMI? HDMI 1.0 is used to carry 1080p high definition TV signal capable of supporting WUXGA (1920x1200), while HDMI 1.3 supports WQXGA (2560x1600) resolution. HDMI 1.4 and HDMI 2.0 support 4K x 2K (4096x2160) resolution. What is the maximum resolution of DisplayPort? DisplayPort 1.2 supports up to 3840x2160, and DisplayPort 1.3 and 1.4 will support up to 7680x4320 (8K) resolutions. What is the maximum resolution VGA interface support? VGA interface transports analog signal and the maximum resolution it can support is 1920x1200.